It's morning. Soft, gray light slips over the tall redbrick wall. It stretches across the exercise yard and reaches through the high, barred windows. In a cell on the ground floor, the light shifts dark shapes into a small stool, a scrawny table, and a bed made of wooden boards with no mattress or blanket. On that bed, a thin, huddled figure, Helmuth, a boy of seventeen, lies awake. Shivering. Trembling. The executioner works on Tuesdays. So begins a fictionalized account of the real-life Helmuth Hubener, a teenager in WWII Germany who was arrested for spreading the truth about the Nazis. Helmuth wasn't always such a rebel. As Hitler came to power and Helmuth grew up, he was a fiercely patriotic member of the Hitler Youth. But as the war raged on, Nazis imposed many restrictions on daily life. Besides persecuting Jews and other groups in Germany, the Nazis made it illegal to read unapproved books or listen to radio broadcasts from outside Germany. When Helmuth discovered a way to listen to the BBC broadcasts about the war, he found out the truth that the Nazis were hiding from the German people. And he knew he had to pass along that truth to everyone he could reach. I must admit that fictionalized biographies don't do much for me. Having read Hitler Youth, I knew a bit about Helmuth's story which may have lessened the tension for me. Bartoletti includes a length author's note with photos of Helmuth and his friends and explanations of what happened to them after the story leaves off. I get that no one can know exactly what Helmuth went through after his arrest as he waited to hear whether he would be executed. But for me, I think I would have liked the book better if it had either been an actual biography or if it had been a totally fictional character inspired by the true story of Helmuth Hubener. That said, it's still a powerful story that deserves a wide audience. I'd hand it to anyone interested in WWII and be sure to have Hitler Youth ready for when they finish. 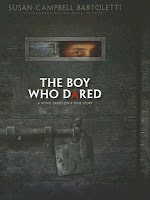 The Boy Who Dared is on Mock Newbery and Mock Printz lists all over the place and it's gotten several starred reviews. Also read reviews at Librarilly Blonde, Teenreads.com, and Ms. Yingling Reads. Be sure and stop by Ms. Bartoletti's website. I really enjoyed this book. I read it before I picked up Hitler Youth so very much felt the tension of the story. They are making a movie about Helmuth, based upon his life (not the book). Haley Joel Osmant is Helmuth. I need to double check the release date.